Schacht, originally uploaded by eirual. Check out the new wheel! 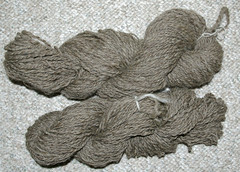 The yarn displayed is spun from the roving that came with the machine. I am getting better, still a bit novelty but getting better. NZAK - Houston we have a tube!, originally uploaded by eirual. Whoo hoo!!! 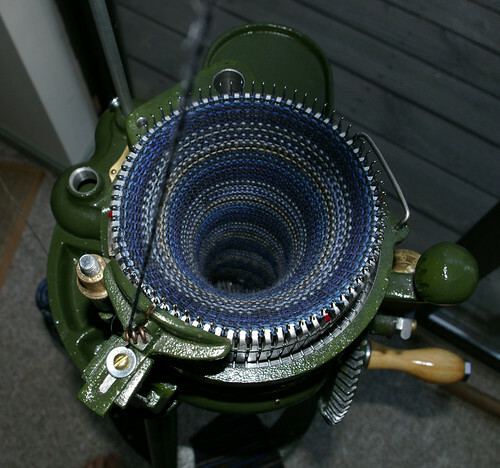 I can now knit a tube! This is my new toy - a 2007 NZAK. 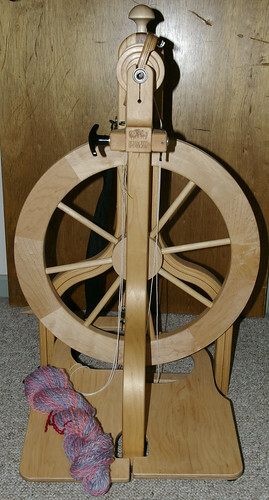 The WoolLee Winder is the single best invention in the pursuit of spinning. Bar none. This thing is awesome, smooth, even feeding of yarn onto bobbin, worth every penny. There is no substitute for a Lazy Kate. No, putting wire through a cardboard box is not a viable substitute. So, I am in search of a Lazy Kate - because I am not going to deal with the alternative again - it sucked. Although my cats loved playing with the wool - they were good enough not to break up the roving too bad. I DESPISE the plying head that came with my Lendrum - and will sell it and all the original bobbins as soon as I take a picture of them. The WooLee Winder is that good. Here is my creation - an entire 3 day weekend spinning and this is what I get 250 yards of what can only generously be called Novelty yarn. I picked up spinning after about 8 years. It's amazing but it all comes back to you - just like riding a bike :) One thing I have needed, but never purchased is a Niddy Noddy. I saw some really nice ones at MD Sheep and Wool this year but could never bring myself to purchase one. Since I am toying with the idea of dyeing my own fiber/yarn, I liked the concept of a niddy noddy made out of pvc. Cheep and durable. After using the directions found here for the general concept and arm length information, as well as here for the specific center post lengths. I was able to put together 2 complete niddy noddys from a 10ft piece of PVC pipe (obviously if you only want to make one niddy noddy - you only need a 5 ft piece). Total cost, including pvc cement (for use on the T's, and 3 of the 4 endcaps) was $7. So, for $3.50 I have a 1m, 1.5m and 2m niddy noddy (obviously not all at the same time).